If one were to follow – and believe – what the Labour Chief and the Manpower Ministry say, one would be inclined to think that the unemployment situation here in Singapore is “not as bad as feared”, as one Straits Times report put it. It seems that even “unleashing this unique Singapore advantage” has not stopped the tide of retrenchments. 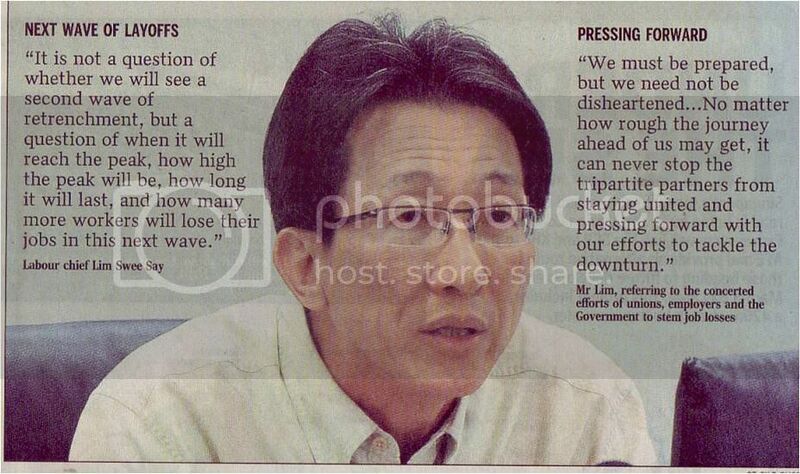 Three months after Mr Lim made that statement, the Today paper reported that unemployment in Singapore had reached record levels not seen in six years. So much for the “unique Singapore advantage”. It seems that the NTUC Chief is just sitting tight and waiting for retrenchments to peak. In the meantime, the situation continues to deteriorate. Headlines such as, “Jobless pool shrinks”, “Jobless rate hits 4.8%”, “Expect more layoffs …” provides proof of the dire situation. The Singaporean worker, thus, is at the complete mercy of his employer. Anecdotal evidence points to discriminatory practices such as age, language and even gender discrimination by employers, together with employers’ preference for hiring foreigners even for jobs which Singaporeans can do. The government’s response, which seems to miss the point, is to insist that Singapore needs foreigners. Singaporeans understand that the country needs foreigners. Their concern is whether we are opening the door too wide to foreigners of every ilk, even for jobs which Singaporeans can perform in. The government, however, seem to not want to address this. It is with this in mind – protecting the Singaporean worker – that the event in Hong Lim Park this Saturday was conceptualized by five Singaporeans, including this writer. Please come support the event and show support for the Singaporean worker. It is time that we demanded the government do more for the Singaporean who’ve worked hard and slogged for long hours all these years. Perhaps the Labour and the Manpower chiefs should start thinking about “unleashing the unique Singapore advantage” to protect our workers instead of engaging in meaningless rhetoric and semantics. Read also Ravi Philemon’s blog entry, “A webchat with Mr Gan Kim Yong and Amy Khor“. Ravi will also be one of the speakers at Hong Lim Park this Saturday (9 May at 5pm).